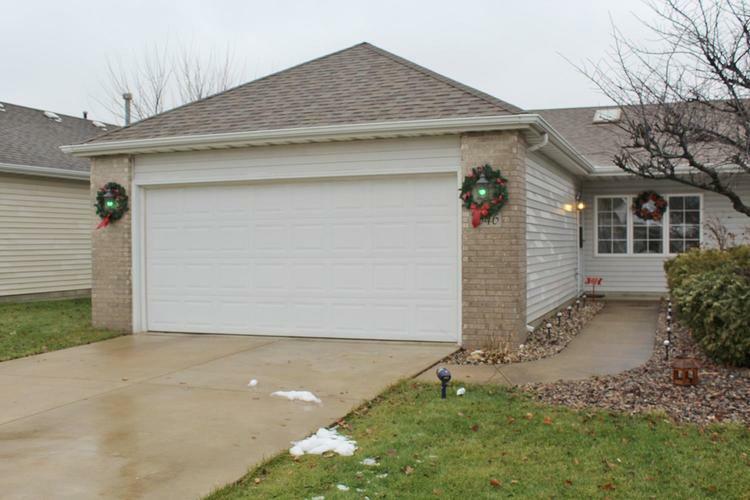 Wonderfully maintained ranch style paired villa in Crown Point's Prairie View neighborhood. This 3 bedroom, 2 bath home is open and light with skylights in the cathedral ceilings which carry from the great room into the eat-in kitchen. The kitchen offers tile flooring, refinished cabinetry, stainless steel appliances and French doors opening to the back patio with privacy wall. The master bedroom is spacious and features a walk-in closet and private bath with large walk-in shower. Bedrooms 2 and 3 are located conveniently close to the updated full bathroom. The laundry room opens to the 2 car attached garage. Wonderfully convenient location close to shopping, the sports complex, highways and minutes to downtown Crown Point. No HOA dues. Call today, this won't last long. Directions:From Broadway, west on North St. South on Madison, west on Dogwood to home.